When it comes to central heating control, and keeping one eye on economical spending, the Nest Learning Thermostat is a clever little package. Easy to install and manage, with the potential to save energy and therefore money, it's a choice option for a modern thermostat. It's already got better through updates - and having seen such improvements the idea of yet more improvements means it'll only get more intelligent in the future. We had Nest 3.0, the smart learning thermostat, installed at the tail-end of 2015, replacing the 2.0 model installed in the summer of 2014. Since then it's been sensing and learning our heating habits. Good job, as the wintry cold spell has really stuck in. Now, we know a thermostat probably sounds oh so boring - even a smart one like this - but one that learns your heating habits, that you can schedule from an easy-to-use app on your phone, and adjust over Wi-Fi from wherever you are in the world? C'mon, that's cool. Or, more to the point, warm. Updating from second-gen to third-gen Nest and having the time to live with the Learning Thermostat in conjunction with Nest Cam for three months has been ideal to update our experience with the system. So what's new? Nest 3.0 has a slightly larger screen and is more resolute than its 2.0 predecessor, but is also a whisker slimmer, while adding better sensing technology, 5Ghz Wi-Fi compatibility and hot water controls (as applicable) too. Following a March update the Nest app can also track your smartphone - and those of up to 10 family members too - for enhanced Auto-Away control. With plenty of competition for smart heating systems - from the likes of Hive, Tado and Honeywell Evohome - how does Nest 3.0 stack up? Does it iron out all the cold moments of its predecessor to reign as king of the smart thermostats? The £249 cover price of the Nest Learning Thermostat includes a professional install (take a look at Nest's official site for details). That means your existing thermostat will be replaced and Nest will be installed - whether on the wall or, as we opted for, via a plug socket and mounted on the Nest Stand (which is sold separately for an extra £29). Note, Nest 3.0 needs a different stand to Nest 2.0 due to size differences, should you be thinking of upgrading. Whatever you opt for, however, you'll need open access to your boiler - so make sure it's tidy and accessible for work, as a separate wall-mounted timer box (called Heat Link) will need to be installed. Even if you've got a relatively old boiler - our combi has an analogue 24-hour wheel with on/off switches, it looks well retro - it shouldn't be a problem. If you've got concerns about your boiler's compatibility then take a look at Nest's own installation page which will assist with compatibility. The Heat Link box is wired in to bypass existing timers, like a clever technological parasite, and accepts the mains power available from the boiler without the need to go digging holes or adding new electrical wiring into the walls. For us the Nest 3.0 install was interesting because swapping out from Nest 2.0 meant the new Heat Link box could use the existing wired connections to the boiler. It was, therefore, a super-fast update taking only about 15-minutes to install. Our earlier Nest 2.0 install from scratch was a longer process of about an hour given the more considerable amount of work that had to be done, so you'll need to allot that amount of time for a brand new install. Our installer knew the product well due to hundreds of previous installations - and having a pro will be priceless for most. We certainly wouldn't advise buying Nest and trying to install yourself unless you're a professional. If you are then doing so will save you £50 on the full install price - the hardware is £199 (up from £179 for Nest 2.0) - and might be quicker as there's no waitlist time to find a qualified fitter. Once the install is done, download the Nest app on your smartphone - it's iOS or Android only for now, with no Windows Phone compatibility - and the Learning Thermostat is clever enough to recognise a phone on the same Wi-Fi network for sync. Should it not, a manual registration is easy to figure out, but it goes without saying that Wi-Fi is an essential. If the network goes down then so too does the ability to remote control via the app and, of course, to relay information to your boiler. No need to panic, though: a physical button on the Heat Link box can be pressed-and-held to override the heating and pop it on for a manual boost of heat. Interestingly Nest 3.0 adds 5Ghz a/b/g/n Wi-Fi connectivity (in addition to 802.11b/g/n at 2.4GHz), but we're not really sure why. Such a frequency is better for faster, short-range coverage, and given our Thermostat has a wall between it and the router, plus two more walls between that and the Heat Link box, it's surely better to use the existing 2.4Ghz range? We don't know how the product auto-switches between the two frequencies, but what we have noticed with Nest 3.0 is a lot more drop-outs and disconnections than we ever had with Nest 2.0 - but that could be put down to our awful Virgin Media router. The Nest phone app is our preferred way of controlling heat, but using the thermostat itself doesn't disappoint: its single circular face acts as a button, while the metal exterior rotates infinitely to cycle through settings and, importantly, the current desired temperature. The display turns orange to let you know when heating is taking place, and also provides a time estimate of how long it will take to reach the desired temperature, which Nest calls Time-to-Temp. The Thermostat includes sensors to monitor temperature and humidity where it has been set-up - so that's something to keep in mind. If, for example, it's installed in a small room that retains heat better than other larger rooms in the house then it will assume its temperature reading represents that of the whole house. For Nest 3.0 there's improved sensor range, which Nest calls "Farsight", to catch motion at greater distances and with heightened accuracy compared to with Nest 2.0. It's certainly a lot better, catching motion and displaying a nice analogue or digital clock face and the current temperature as a result. As the thermostat operates as a feedback system it won't keep on heating once the desired temperature has been reached to conserve energy. That's far better than just lobbing the heating on for two hours at any given time. 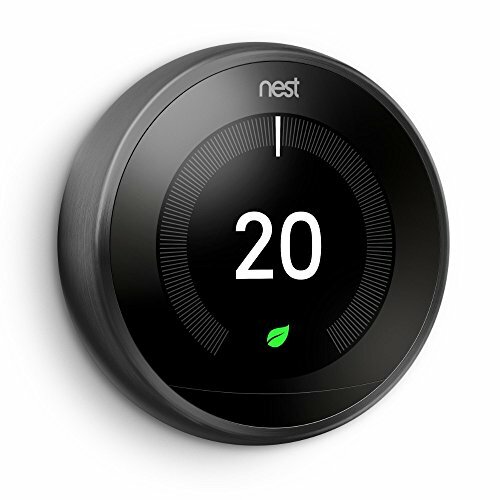 If the temperature drops half a degree below your optimum setting then Nest will ensure it kicks back in again. Choosing lower temperatures will generate a Leaf symbol to show that you're conserving energy, the idea being your overall costs to the gas man decrease too. Unfortunately Nest has no way to individually control multiple zones or rooms in your home, because it's not positioned at multiple radiator points like, say, Honeywell Evohome can be. However, Nest can be connected to multiple boilers if you have more than one in your home (read mansion), and the system can handle two separate homes at once. So if you already have a zoned heating system then you'll need a Nest Learning Thermostat for each of those zones, all of which can be controllable from within the one app. However, using multiple Nest Learning Thermostats raises an interesting point: you can monitor others that you've registered with. Whether you want to know, for example, that your elderly mother has got an ample temperature in the house, or your unoccupied holiday home (yeah, we wish) doesn't have the pipes freezing over during winter, you can not only monitor the ambient temperature in real-time, but also make heating adjustments and schedules as necessary. All those Nest readings pool into the one application interface and can be controlled remotely. As we'd touched upon Nest 3.0 can also handle hot water separately to central heating, if you're running a tank operation anyway. Many smaller houses, ours included, run combo boilers these days, without the need for such separation. As such we're unable to test this feature directly for review, merely mention its presence. It's a positive step forward, though, and one of the gripes we had with the earlier install's capabilities. When we had Nest originally installed we set a baseline temperature threshold to 15C, but during the summer months that meant the heating never kicked in. The Thermostat sensed when we were at home, however, so it was still learning, ready for when we began to introduce temperatures to it during the winter months of 2014 and beyond. Then Nest 3.0 comes along and - boom - all that data is gone, because it's like a hard reset. With the new install comes learning from scratch which, for a "smart" thermostat system, doesn't really seem all that smart, does it? Nest can learn pretty quickly though, responding to your input and, as mentioned, registering times when you're at home (or not) using Farsight motion detection and, now, GPS location data from your smartphone. This is all officially called Nest Sense and the smartphone integration makes it a lot more intelligent than before. Far too many times we've been sat in the office at home, only for the heating to switch off because it thinks you're not at home. That no longer happens because, one, the GPS data lets the system know you're at home and even if this position data remains static, the thermostat control itself is still looking for sound and motion data and learning your daily routine (if you have such a thing). So even at times when the system has thought we've gone out due to inactivity, it pops on Nest Cam - a separate product which we have as part of the ecosystem - and our motion will feedback to the system and confirm we're in, avoiding the Auto-Away feature. Finally, a feedback loop that's fixed. Well, almost. Because Nest does still have to learn. And sometimes it can freak out and decide to pop the heating on when it seems unnecessary, or way ahead of your existing schedule by believeing it needs a couple of hours to reach ample temperature. It's slowly figuring it out, but from day one Nest, in our experience, isn't a perfect install - it needs some time. The introduction of GPS input from registered users' smartphone locations is a feature we've long been calling for - the fact it's taken this long is somewhat baffling really. But now it can compete with the likes of Tado (which also tracks your movements based on phone GPS and will even switch the heating on to be at the exact temperature for when you arrive home from work) and Hive by British Gas (which knows when you're en route home and will prompt an alert that you might want to switch the heating on). Yep, Nest knows where you are - which is kind of creepy, but kind of cool - and we've not seen our phone battery take a hit as a result. We've not needed to add anyone else to the network, but it's possible to link up to 10 separate accounts to the Family Accounts section, each of which has input to the learning - but can't adjust core admin, such as Wi-Fi password, address, and so forth. Having to restart scheduling hasn't been too bad for us in our setup. We've generally let Nest 3.0 do its thing, learn our routine, track when we're in and out, and set its schedules accordingly. If you don't want a constant baseline temperature of, say, 18C in the home then you can make adjustments to the weekly schedule with variable temperature thresholds (from 9-32C) at different times of day and the thermostat will kick-in accordingly. Temperature settings can be set at 15-minute intervals - and for no less than one hour minimum, which is a shame, as there's no 30-minute morning booster possibility - using an easy press-and-drag interface via the app. Or, if you prefer, it can be controlled on Nest itself which works fine, but is a bit more fiddly to programme given the single press and rotational controls. If your Monday to Friday day-to-day is one and the same then simply copy and paste your heating preferences from one day of the week into another with minimal fuss. It's really easy to make schedules and equally easy to adjust them. However, it's not possible to instruct Nest that you will be "Away" within a schedule - this is only achievable via the "Home / Away" toggle within the app. Using this will assist with Nest's learning, although we largely suspect that smartphone GPS data will be the thing to take over based on your actions over time. The one thing we still think is missing is a top-up booster button within the app where the heating kicks in for, say, an extra 30-minutes or an hour - a setting that Honeywell Evohome offers. Although it might not be the most economical of ideas, we'd use such an option to dry out wet clothes on the radiator in the winter, but wouldn't want such an infrequent adjustment to impact on Nest's learning, whether we're Home or Away. Which, at the moment, might cause difficulties in its understanding of why you suddenly want a 25C boost at an already warm time of day. One thing that's never quite clicked with us, not in our 18-months of Nest use anyway, is seasonality. Because it's typically warmer in the summer months in the home, the heating is less likely to kick in and do its thing with any given daily/weekly schedule. We're not fully convinced the system can cater for draft detection and such like, though, and the variance that may have on you wanting to make different temperature decisions at different times of year. A rather nifty feature is that Nest will email you reports so you know how your consumption is going - Family Account members receive this too, if signed up. Perhaps you used an extra nine hours of heating this week compared to last - it will let you know. Within the app there are daily breakdowns under the Energy History tab too. This details when the central heating was active, for how long, the temperature setting, and whether that was as a result of manual adjustment or Nest's own intervention to maintain temperature. Symbols at the end of each day - shown in a current month calendar arrangement - let you know whether your adjustments caused energy usage above your average, or that Auto-Away assisted in below average consumption. You'll get the Leaf symbol for the day on the opposite side if consumption is low - great to keep an eye on to try and keep your bills lower. It's almost like a bit of a game. When it comes to intelligent heating solutions the Nest Learning Thermostat is the best looking of the bunch that we've seen. Sorry Tado, Honeywell, Hive, et al - even though all of these allow you to control your heating from anywhere you are in the world (with a signal/Wi-Fi anyway) - but Nest 3.0 is elegant looking, easy to use, and we like how responsive the new Farsight sensitivity is in responding to motion. The third-generation model also irons out the previous hot water issue by adding controls for those with an immersion tank, while Family Accounts and smartphone-based GPS data all impact on Home/Away automation for the best experience yet. It's that last part that helps Nest 3.0 smooth out its predecessor's issues (despite some erratic moments during the learning process) and integrate better with Nest Cam and other Works with Nest products. Sure there's still no zone controls (well, they're limited to one thermostat per boiler should you operate more than one; there aren't individual radiator controller options like with Honeywell Evohome) but that's about all that's now missing.